This description is dedicated to the first edition of the book in the year 2000. The author attached importance to a clear and simple understandable description. Each chapter may be read as a stand-alone piece to the interesting topic. 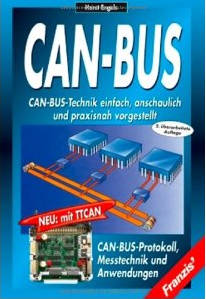 Beginning with the introduction into networks and different bus systems in the field, the book shows reasons and history of CAN development. Following, the CAN protocol (ISO/OSI data link layer) and the arbitration mechanism are described in detail. The components required for a CAN transmission system with related examples follow in the next chapter. Further, physical aspects of reflections on the cable as well as CAN test measurements are given. The book ends with a chapter about CAN applications. Circa 10 pages are dedicated for CANopen explanation written by Uwe Koppe from MicroControl. Within the last 12 years a lot of CANopen developments and specifications were created by CAN in Automation and its members. The second book edition from January 2002 claims to have a TTCAN (time-triggered CAN) description inside.